The Bitterroot Public Libary is pleased to sponsor the with Family of Marjorie A. Crawford this season's literature seminar, making it FREE and open to the public. These lectures will be given by Shawn Wathen of Chapter One. Classes will be held in the basement meeting room of the Bitterroot Public Library (west entrance) from 9:30 to 11:30 am on the designated day. Books are available at Chapter One Book Store. The Bitterroot Public Library will have a limited number of copies available for checkout. Call 363-5220 or 363-1670 for more information. Based in St. Louis Philip Boehm is the author of numerous translations from Polish and German. At this event, he will discuss his recent translations of The hunger angel, a novel by Nobel laureate Herta Mueller that conjures the distorted world of the Gulag labor camp in all its physical and moral absurdity, and An Ermine in Czernopol, Gregor Von Rezzori's novel set just after World War I that centers on the tragicomic fate of an erstwhile officer in the army of the now-defunct Austro-Hungarian Empire. Herta Müller, Atemschaukel (Endnu ingen dansk titel). Herta Müller, The Hunger Angel. 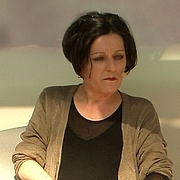 Herta Müller was born in Romania, but her family was in the German minority. She grew up speaking German and learned Romanian at school. Her father was in the Waffen SS, and her mother, at the age of 17, was deported to a Soviet labor camp in 1945 where she spent five years. Müller worked as a translator for three years, but was fired for refusing to cooperate with Ceauşescu's secret police. She worked as a teacher for a while and was a member of the Aktionsgruppe Banat, a literary society that fought for freedom of speech. Her works are fiction, but are often based on people she knew. In 1987, she and her husband, Richard Wagner, were allowed to emigrate to West Germany, where she lives today. Herta Müller's book The Fox Was Ever the Hunter was available from LibraryThing Early Reviewers. Herta Müller's book Tot el que tinc, ho duc al damunt was available from LibraryThing Early Reviewers. Herta Müller's book L'home és un gran faisà en el món was available from LibraryThing Early Reviewers. Herta Müller is currently considered a "single author." If one or more works are by a distinct, homonymous authors, go ahead and split the author. Herta Müller is composed of 13 names. You can examine and separate out names.